Dr. Osamu Motojima, Director General of ITER says ‘if all goes well the ITER project will prove fusion energy is not just a distant dream’. This is till date the world’s largest scientific project ever to be undertaken and it is getting off the ground in Europe, a mammoth project that experts say will pave the way for generating unlimited clean nuclear energy by fusing atoms, a process not very different from what happens on the sun. The reactor will weigh about 23,000 tons, the equivalent of the weight of three Eiffel Towers. Some 80,000 kilometres of special super conducting wires will be used. Six nations – India, China, South Korea, USA, Japan, Russia, and the European Union have joined hands as equal partners to see if they can jointly harness the power of the sun by literally confining it in a steel bottle. According to the head of ITER, Dr. Osamu Motojima, together these entities “represent half the world’s population and account for two-third of the global economic might” so according to him the best chance of harnessing fusion power is at ITER. Within the massive steel frame, gas will be heated to over 150 million degrees temperature and it will be confined into a limited space using giant magnets, some atoms will then fuse together releasing huge amounts of heat which can then be directed to run turbines to generate electricity. In the first instance, it is hoped the fusion reactor will produce 10 times more energy than what is used to initiate the reaction estimated to produce the equivalent of 500 MW of power. At ITER the world’s largest refrigerator being made by India. But it is easier said than done, since taming the power of the sun is a Herculean task. For the last half a century scientists have dreamt about this feat but it was only in 2006 when the organisation, ITER, came into being that things started become real. Recently, some 800 of the best brains in the world from more than 35 countries gathered to take stock of fusion energy at the International Conference on Thermonuclear Fusion Energy held from October 13-18, 2014 at the picturesque town of Saint Petersburg, Russia. The mood was generally upbeat but there are worries that cost and time over runs could spiral out of control in this mammoth exercise. Motojima admits there have been ‘delays’ and hopes by next year, his team will be able to give a firm schedule on when ITER could be completed. 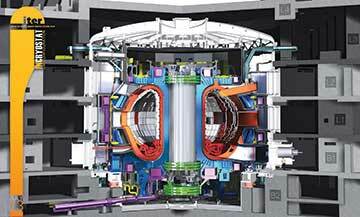 India is a full member of the fusion energy reactor coming up at Cadarache in France. India will make in-kind investment probably totalling about Rs 9000 crores over the next decade thus contributing about 9.1 percent of the share of the total costs. Motojima says he is ‘happy with India’s on-schedule and within budget robust contribution’ and adds that in return in the long run ‘India will get access to 100 percent of the intellectual property that goes into the making of the ITER’. Once the proof is established that mankind can harness the power of the sun, India could well build its own fusion reactors possibly very soon after 2050, thus providing unlimited energy. Why are scientists looking for different forms of energy? What could this experiment mean for the world? What is the fuel that is responsible for the sun’s energy? Or how does the sun generate energy? How is this fusion different from nuclear fission? 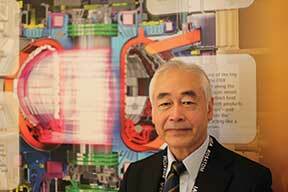 Find out how much power a fusion reactor will be able to deliver and at what cost?